While it’s hard to really create a brand new story for children, since probably most have been told in one way or another, it is exciting to see some old themes reworked very creatively. 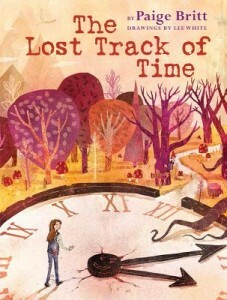 The Lost Track of Time is a new (2015) children’s book that is a brilliant blend of inspiration from The Phantom Tollbooth, and my favorite book, Momo (though perhaps the author never read Momo). The premise is that the best inspiration comes from having the time to let one’s imagination run free. In this allegorical children’s book, like The Phantom Tollbooth, we journey to an imaginative land, The Land of Possibilities, which is now in a sorry state. Along the way, there are lots of puns and jokes, and the whole children’s book is fun and lighthearted, despite its insistent message: over-programming children, or adults, is a sure path to loss. Some reviewers found the book too didactic. I don’t know if I would say that. I liked it, though perhaps it is a tiny bit long. On the other hand, the book itself is like a work of art, with lovely typeface and funny illustrations here and there on some pages. Personally, I loved this children’s book, and would read it a second time, to really savor the word play and the plot.